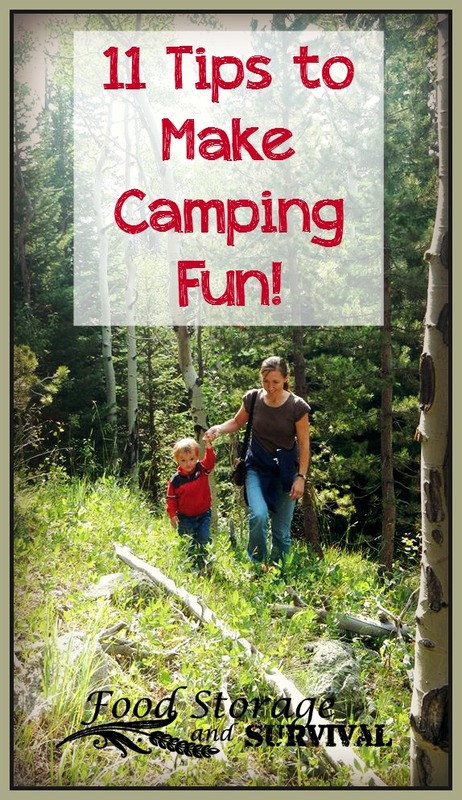 11 Tips to Make Camping Fun! Planning your next camping trip? Camping has been a part of my life from when I was very small. I like it so much, when I got married we went camping on our honeymoon! Camping is also a great time to practice some preparedness skills! To help everyone enjoy their time camping, here are eleven tips to make camping fun on your next trip to the outdoors! 1. Leave the electronics home. That’s right. No mp3 players, game gadgets, or unnecessary phones. You adults may want to have your phones handy in case of emergency, but keep the screen time to a minimum! You’re there to enjoy each other and nature together, not stare at your favorite screen in different surroundings. 2. Bring the comfort necessities. If your child needs a particular blanket, stuffed toy, or bottle to keep him happy, the camping trip is not the time to leave it home! Speaking from experience here when we accidentally left the bottle home and had one l-o-n-g miserable night with a baby that would not be comforted. For you adults, it may be your favorite drink or chocolate or your makeup or a decent pillow. You want this to be a memorable experience and fun, so don’t forget those comfort items (but only if they abide by tip #1)! Headlamps leave your hands free to set up the beds, build the fire, or cook in the dark. Solar yard lights can be used to mark the edges of your tent, tie outs, or any other location you want to find after dark. Glow sticks provide light after dark that won’t run the batteries out of your flashlight. We especially like the UVPaqlite reusable glow sticks. Glow sticks or necklace style flashlights can be used to easily keep track of small children after dark as well. Camping lanterns are great for lighting an area when you want some indirect light. You can make a make-shift lantern by strapping a headlamp to a jug of water like this! 4. Bring fun. Kids can do a lot with just sticks, rocks, and dirt, but it’s a good idea to bring some fun along with you as well. Indoor fun (in case of inclement weather! ): books, card games, coloring books and crayons or colored pencils, crafts. 5. Prep the food. Some people love outdoor cooking. I’d rather be playing than cooking, but I still want to eat well when we’re camping, so I do a lot of meal prep before we go. Make a plan for what meals you’ll be making while you’re on your trip and break each one into ingredients to make sure you have all that you need. Include a list of the cooking pans and utensils each meal requires! Pre-cook meat. We like to pre-cook it a day or two in advance of the trip and then freeze it so it stays cold in the cooler longer. Use dehydrated or freeze dried foods to speed up meal prep time. Pack meals together as much as possible to make it easy to find all the ingredients. 6. Let the kids help. Depending on their age and abilities, children can help pack their own clothes and gear, set up the tent, gather firewood, start fires, and cook food. Get them involved and the camping work can become camping fun. 7. Keep clean. Your children will be less concerned with this than you are, but when I’m filthy I’m not happy, so keeping clean is necessary to a fun camping trip for me. Slip a bar of soap into a clean nylon stocking and tie it around the water dispenser for a quick hand washing station. You could also use a cleaned out liquid laundry detergent bottle for hand washing water–the kind that sits on it’s side and dispenses through a push button spout. Even a kid can’t leave that on and have it run you out of water! We also love baby wipes or body wipes, and for the longer camp outs we take along our weed sprayer camp shower. 8. Remember safety. We don’t want anyone falling in a river or off a cliff or into the fire or wandering off and getting lost. Survey your campsite for possible dangers and relocate if necessary. Make sure the children know the boundaries they are allowed to explore in. Bring a pack and play or baby backpack to contain the smaller children. No food in the tent if you’re in bear country! 9. Have first aid supplies and skills. Someone is bound to get a scratch or burn or blister of some kind. It’s just the nature of being outdoors. Be sure you have the medical supplies to treat the most common injuries you’ll encounter and the skills to use those supplies. Take preventative measures to keep from needing medical help by using common sense, insect repellant, and sunscreen. 10. Take pictures! Better yet, actually get them developed and put them in a physical album. Look for the fun and capture the memories of this camping trip. You’ll all be able to look back on this trip and have fond memories of it years from now through those photos. 11. Remember it’s an adventure. Everything may not go like you planned. Maybe you get rained on every day and the tent leaks like crazy. Maybe there were more mosquitoes than you planned on. Maybe a giant pine beetle landed in your dinner before you could dish it up. It’s okay. It’s an adventure. Focus on the misery and you’ll be miserable. Focus on the good and the fun and the trip will be an adventure! I talked about a lot of these tips in a recent podcast! Check it out here. What about you? What are your favorite tips for making camping fun?